Fish Canyon Falls above Duarte. Photo by Mitch Barrie, via Flickr creative commons. This is great news, folks. We have a lot of excellent trailheads and hiking paths in Los Angeles but far too many of them are tough to reach via transit. The city of Duarte has solved that problem: a new shuttle van will run between the new Duarte/City of Hope Station on the Gold Line and the Fish Canyon Falls trailhead on Saturdays in April and May. The shuttle will run from 7 a.m. until 6 p.m. and pick up riders every 30 minutes. Service begins this Saturday (April 9). More info on the city’s website. 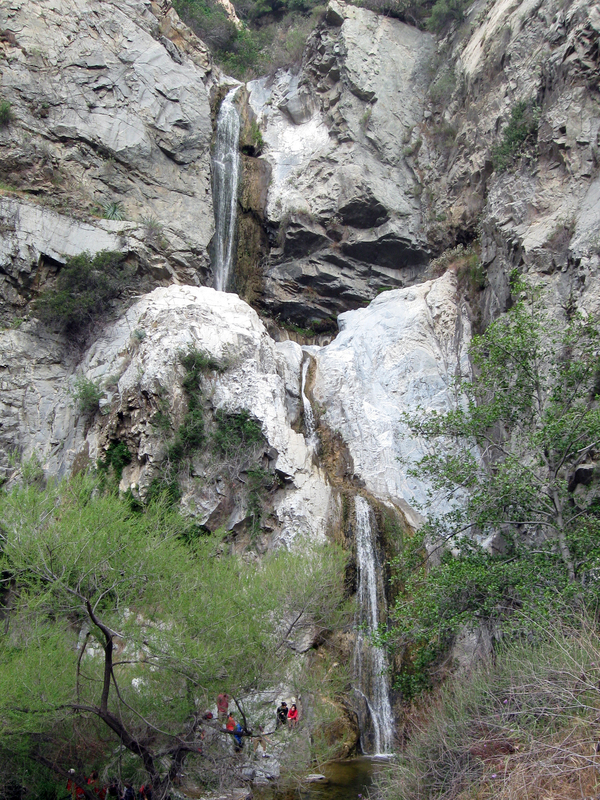 The hike to Fish Canyon Falls in the San Gabriel Mountains is about 2.4 miles (or 4.8 miles roundtrip) with an elevation gain of 836 feet between the trailhead and the falls. The Modern Hiker site rates the trail of “moderate difficulty” and has an excellent description, including the video below. Access to the trail — which begins at a rock quarry — was greatly improved in 2014 with the opening of a new section of trail through the quarry and a new trailhead parking area. The city of Duarte funded the shuttle with local return money from Measure R, the half-cent sales tax approved by Los Angeles County voters in 2008. Measure R largely funded the Gold Line extension to Azusa, too. I have been meaning to get out to this place for a hike. This is great news.